In the unlikely possibility of something going wrong when you travel with Haivenu, we guarantee compensation up to the full cost of your tour. For worldwide clients, when you book a tour with Haivenu, the contract will be between yourself and Haivenu Co., Ltd (Vietnam). Haivenu Vietnam is a fully licensed international tour company affiliated to the Vietnam Tourism Association (VITA), the Pacific Asia Travel Association (PATA - Vietnam Chapter), and the American Society of Travel Agents (ASTA). 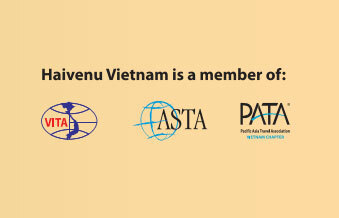 We are fully licensed by the Vietnam National Authority for Tourism (VNAT) as an International Tour Operator. Our International Tour Operator Licence number is 0086/2002/TCDL-GP LHQT. The terms of our licence require us to place a substantial cash bond in a secure account. The account has two signatories - Haivenu and VNAT. To ensure fair treatment for yourself and us, we have drawn up a 'Complaints' procedure that includes the resolution of disputes by a neutral arbitrator. Since we established Haivenu in 2000, we haven't needed to use the Complaints procedure or withdraw money from our bond account! © Haivenu – all rights reserved. we cannot be held responsible for inacuracies or changes which have escaped our notice.